Born in 1954, Emmanuel is a Lebanese-German painter, sculptor, graphic artist, publisher and musician of Armenian descent. The eldest son of renowned artist Paul Guiragossian, Emmanuel belongs to the 6th generation of artists in his family of musicians, iconographists and painters. her own experience. This affected Emmanuel’s perception of life and as a consequence his work was early on overtly dramatic. At 15, Emmanuel worked with the famous photographer Souren in his studio and later on started working as a creative designer and concept artist in an advertising company and won several prizes, among them the Poster Prize of Bank of Canada. His talents didn’t go unnoticed and earned him an admission to the Académie des Beaux-Arts de Paris in 1972 followed by more advanced courses at the Michelangelo Academy in Florence in 1973. 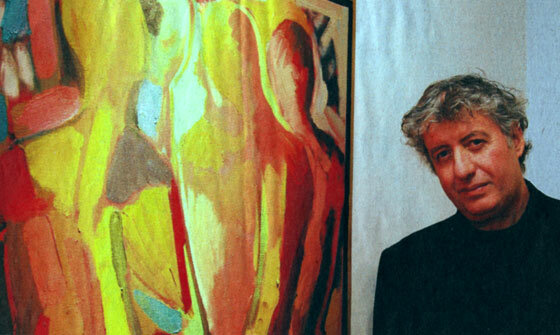 In 1974, Emmanuel obtained a scholarship and attended the Hochshüle fur Bildende Kunst in Dresden-Germany under professors Gerhard Kettner, Siegfried Klotz and Juan Leon.There, he built close friendships with several renowned contemporary artists such as A.R.Penk and worked with them. Emmanuel specialized in Artistic Anatomy and graduated with honours in 1979. By the fall of that year, he returned to Lebanon where he became a professor at the Academie Libanaise de Beaux Arts (ALBA) and the American University of Beirut until 1984. At the same time, Emmanuel began working closely with his father, taking on the task of organizing the art shows, archiving the works and, most importantly, he founded his publishing house EMMAGOSS which published the first book ever made on Paul Guiragossian’s works in 1983. From then on Emmanuel actively worked on several solo exhibitions around the world while residing in Beirut, Germany, Canada and Jordan and published several books including the biography of Palestinian-Jordanian banker and founder of the Arab Bank Khaled Shoman as well as a book on the art of his wife Soha Shoman. museums such as the Spanish Museum of Marbella which brought the exhibition “De Picasso à nos Jours” to Emmagoss in 1995. Emmanuel’s target eventually was to begin founding the first contemporary art museum in Lebanon, which also was a dream of his father Paul. In 2004 The Paul Guiragossian Contemporary Art Museum was built in the suburbs of Beirut. Currently Emmanuel is based in Lebanon and Germany and has founded a second art gallery Emmagoss in Dresden in 2007 where he exhibits works of contemporary German artists such as A.R. Penk, Marcus Lupertz and others including his own. Bernard Hahn and Emmanuel Guiragossian. Dresden, Germany.